Anton Bertilsson went from penthouse to outhouse quickly, as his chip lead evaporated in the early portions of Day 3. He finally got all his chips in the middle preflop with against Chris Convery's pocket jacks. The board ran out , and Bertilsson picked up $16,573 for eighth place. Berrny Lengenfelder was next to fall when he lost a race with A-10 against Grant Nelson's pocket nines. Lengenfelder picked up a straight draw on the turn when the board read , but the on the river gave Nelson a full house and sent Lengenfelder home in seventh place ($20,440). Nelson's luck didn't hold for very long, though, as he was the next out in sixth place ($24,257). He moved all in preflop with , and Michael Holm called with . The board brought no help for Nelson, and his South African Open was at an end. Convery claimed another scalp soon after Nelson's departure when he took out Danny K in fifth place ($28,074). Danny K got his money in preflop with A-J, only to see Convery table A-Q. The on the flop helped Danny K, but the that came with it left him drawing exceedingly thin. No more jacks came down, and Danny K was busted. Convery took out another player soon afterwards when he called Melanie Banfield's all-in with . Banfield showed , and couldn't pick up a ten after the flop. The turn and river read , and Banfield earned $38,331 for fourth place. Michael Holm busted in third place ($63,845) by Darren Kramer to set up heads-up play. Holm pushed his last few chips in the middle with J-5, and Kramer called with K-Q. The board ran out , and Holm headed to the rail. Chris Convery took nearly a 2:1 chip lead into heads-up play, but Darren Kramer proved that anything can happen in poker, doubling through Convery a couple of times to nab the chip lead. The final hand was a roller coaster, with Convery moving all in preflop with , and Kramer making the call with . Convery picked up a pair on the flop, and Kramer found a straight draw on the turn. The on the river was the dagger to Convery, as Darren Kramer picked up a straight to take down the South African Open and the $140,575 first-place prize money. Convery won $95,826 for his second-place finish. Win a Seat to the South African PokerNews Open Through CD Poker! 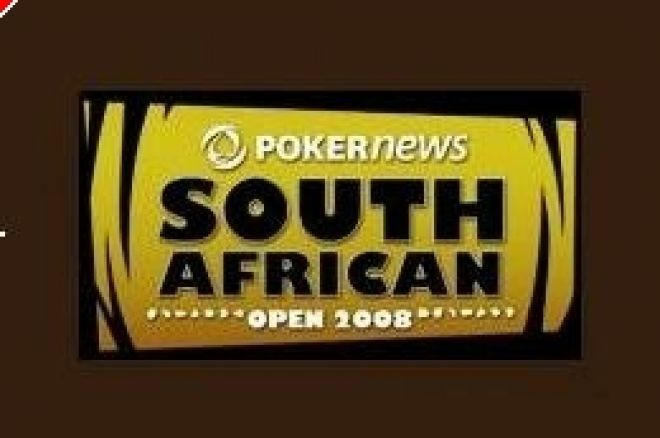 Win Your Place at the 2008 South African PokerNews Open Through Duplicate Poker!